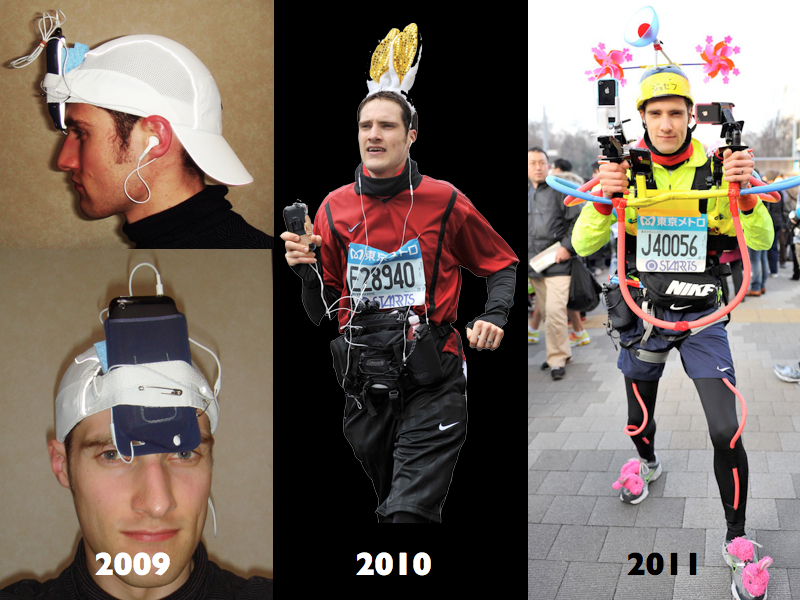 It’s been almost 6 months now since I completed the Tokyo Marathon 2011 whilst wearing the iRun. Following the big day itself I needed at least a week to get over the physical and psychological trauma that I had inflicted upon myself through carrying out this stunt – and then just as I was about to review and summarise the challenge, Japan was struck by the March 11th earthquake, resulting in life as we knew it being turned upside down (even for those of us in Tokyo a long way from the epicentre). Thus, it’s only now that I find myself with the time to tell the full story. 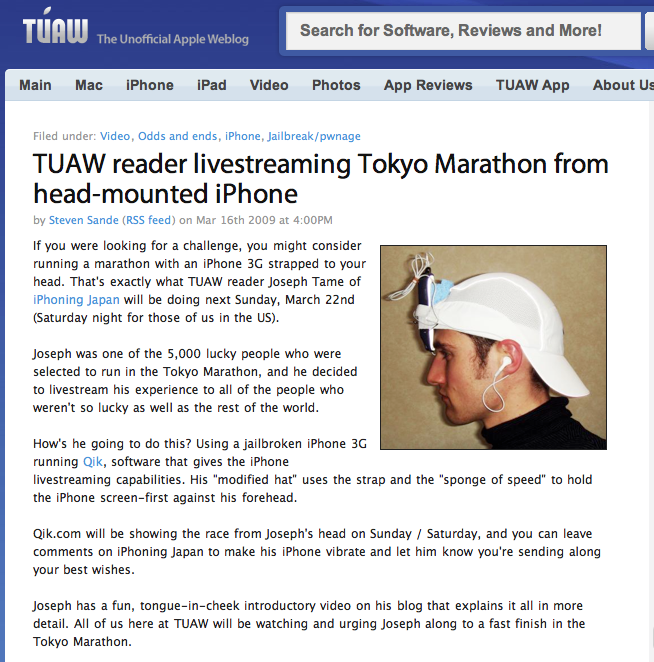 The Tokyo Marathon live broadcast project began in 2009, shortly after live streaming was first made technically possible from an iPhone here in Japan. I’d only taken up running a few months beforehand (having never done any sports since cycling as a teenager), encouraged by my friend Tom who suggested that we run around the Imperial Palace once a week to catch up on news and get a bit of exercise. 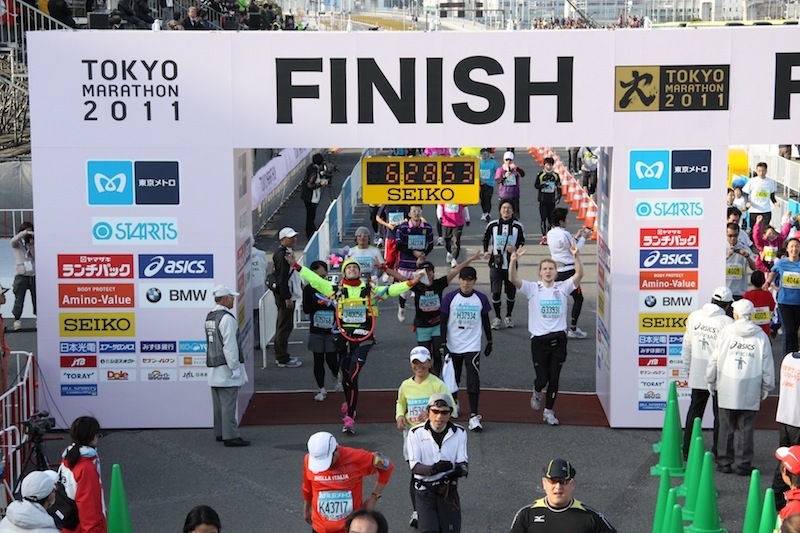 The idea of running the 10 km quarter marathon seemed to me to be a huge challenge – I was still finding myself out of breath and exhausted after a 5km circuit of Japan’s favourite running route. Being a huge Apple fan and obsessive about recording every aspect of my life (I started writing a daily diary at age 10, which eventually filled some 45 volumes, up until about the age of 22 when I started using the Internet a lot more), I was keen to see how I could integrate technology into my running so that once I returned home I would have a record of what I had achieved. Back then I was using Everytrail on the iPhone; I found that by focusing on taking photographs for the virtual map and checking my statistics as I ran I was able to complete longer distances with less trauma. When it came to my first marathon – the 2009 10km Tokyo Marathon – I decided that in addition to using EveryTrail I would also live stream the experience over Qik (Ustream wasn’t available for the iPhone at that time), allowing people who hasn’t been able to enter the totally oversubscribed run to participate virtually, but also so that I could receive the support of viewers who, by commenting on my stream, would make the phone vibrate against my forehead. Thanks to an article in TUAW about 1,000 people joined me for that run. Surprised by this success, when it came to the 2010 Tokyo Marathon (my first full marathon) I knew that technology was the key for me to complete the longest run of my life thus far – I needed a distraction from the reality of the distance I had to cover. 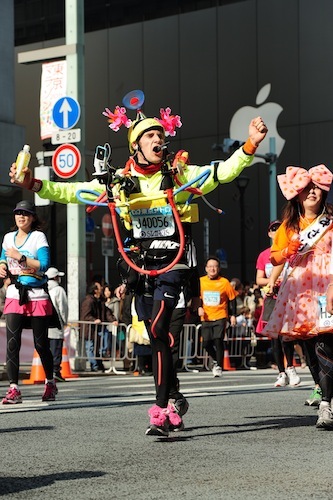 Live streaming offered that, ensuring that my mind was fixed on providing a running commentary (in both English and Japanese) of the marathon experience to entertain my audience. 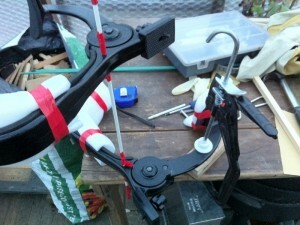 In early 2010 I created a slightly more high-tech holder for the iPhone that was to stream live video during the race. It consisted of an iBike – a waterproof case for the iPhone – modified with a series of metal brackets and a large strip of elastic. This was then attached to my hat providing a clear view of the road ahead. However, disaster struck after only 5 km when iRun 2.0 suddenly disintegrated – I was left having to hold the iPhone in my hand for the remaining 37km. Despite this, the event was a huge success, read more about it here. When I was lucky enough to win the marathon-entry lottery for a third year in a row (almost unheard of due to the race’s overwhelming popularity) I knew I had to do something extraordinary. Inspired by technological developments (such as the release of the iPhone 4 with its front and rear facing cameras) I decided to try and capture every aspect of the challenge, and stream this to a live global audience. I wasn’t just thinking video – I wanted to share as much data as I could (such as heart rate, temperature, humidity, noise levels, C02 levels etc), and enable 2-way communication with both a static studio crew and a global audience. It was clear that I needed a revolutionary device. As well as iPhone improvements we now had more choice when it came to mobile data networks – alongside Emobile, Docomo had now released a pocket Wi-Fi router, and WIMAX was finally useable. I experimented with a number of different designs for the iRun. One problem I’d consistently had with mounting cameras on my head was the movement: the iPhone wasn’t exactly the lightest mobile camera out there, and no matter how well it was attached to my head the resulting movement tended to make my viewers feel seasick! Also, I was unable to monitor the stream for feedback, or identify when we were having problems with the signal. It became clear to me that I needed to have some kind of chest-mounted system, but how was that going to work? Luckily I have a friend who is even more of the gadget lover than me. 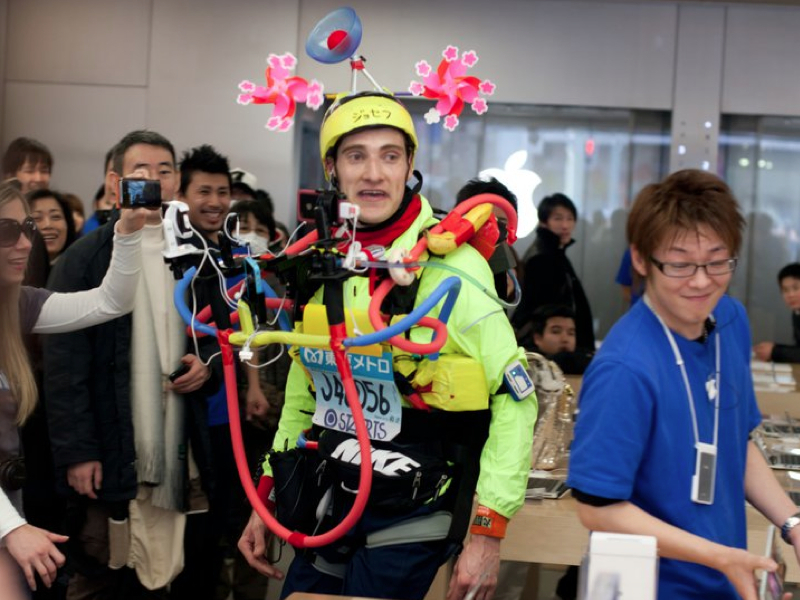 He’s usually the first one in Tokyo to have the latest and greatest tech toy, and this time around was no exception. He’d picked up an iKan recoil camera mount – a lightweight steadicam type device which could easily be slung over your shoulder. When I saw that I immediately recognised the potential, it was simply a case of bolting two of these together to create a frame which could be lowered over my head, secured tightly to my torso, and then covered in cameras and other accessories. Thus the iRun 3.0 was born. From that point on development of the iRun proceeded fairly quickly. I worked with my dad back in the UK over the New Year on the basic structure, and then started trialling it out on the road. I added a great deal of padding and figured out the ideal position for the cameras and other devices that would feature on it. My field trials tended to be fairly limited, and in fact by the time of the marathon itself the furthest I had ever run with it was 10km – a painful 10km. Meanwhile, I also worked to assemble a star team of mobile-broadcast crews and studio staff. The image I had for the final production was similar to the coverage you might see produced by a sports program. We needed multiple cameras shooting the action from multiple viewpoints. Whilst my two cameras were a start they weren’t enough to capture the full festive spirit of the marathon. So, as they’d done in 2010, a group of friends very kindly stepped up to the challenge and took on the role of camera crews, production assistants and commentators. The good people at Virgin Earth Inc agreed to lend me a studio, enabling us to have a central location where all the video feeds could be mixed, messages from the supporting public collated, and all communications with me out on the course be coordinated. In total this team numbered about 25 volunteers. 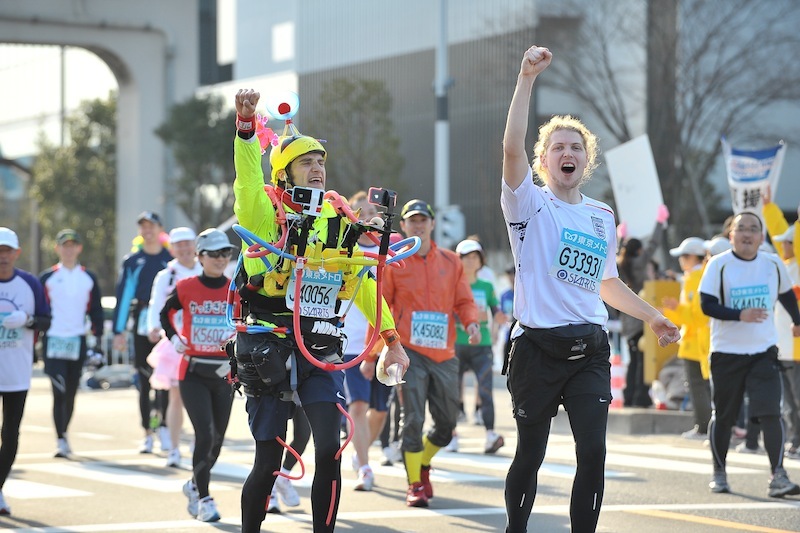 I was also fortunate to have the support of a number of in-kind sponsors including Nike Japan who provided my clothing, and Wahoo Fitness who sponsored my heart rate monitor, meaning that I could finally broadcast my heart rate to the world, live! In the meantime media interest in the project was growing. Myself and a friend made a promo video on the streets of Shibuya, and following that I had my live TV debut on a local Tokyo station. I sent the word out to a few Mac related websites and it wasn’t long before the story started to go viral. Engadget picked it up and within hours it was being translated and republished all around the world. Newspapers, magazines, radio stations, the Associated Press, Discovery Channel and all Japanese national TV networks contacted me for interviews. In the meantime CNN decided to feature the project, spending some time with me both before the marathon and then having two cameras follow the action on the day (the result being the video that you see above). Because of all this I slept very little in the week leading up to the race itself, and on the morning was running on adrenaline alone. 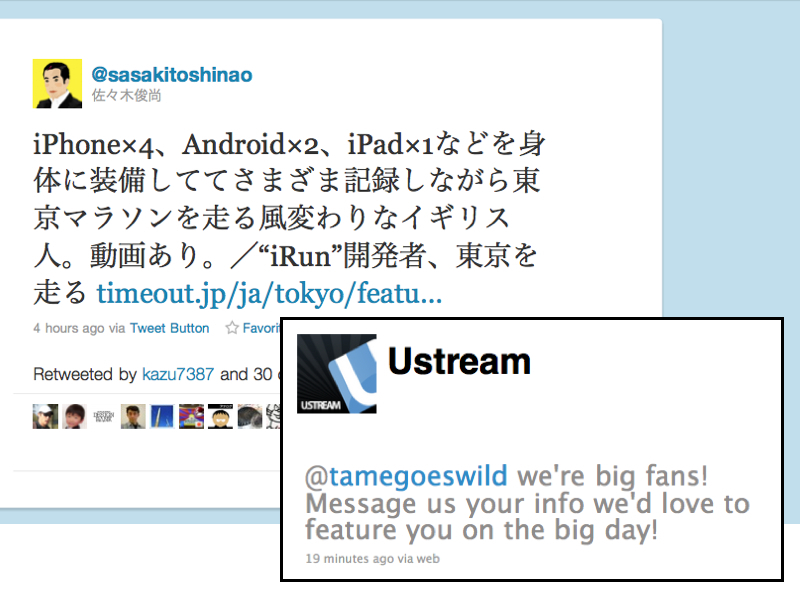 Ustream contacted me offering to feature me, whilst the twitter community also got on board. After just a few hours sleep it was time to get up and prepare to run. We needed to arrive at the starting point about 90 min before the gun went off in order to do interviews for the major TV stations. Fuji TV (who had the broadcast rights on the day) provided a camera crew to meet up with me at various points along the course for a feature on Mezamashi TV. Thankfully I would not be running by myself – a friend of mine from my university days, Phil, had also managed to get into the marathon and would run with me. He would be a tremendous help later on as I struggled to change batteries and make my tech work. We started off quite a long way back in the pack, and 10 min after the starting gun had gone off we’d not yet reached the official start line. This lack of speed was to be the theme for the first 5 km, although to be honest I was completely oblivious to what was going on around me as I fought to get the broadcast going. Whatever could go wrong did go wrong – it was almost comical. Having started the live stream approximately one hour before the official race start time my batteries were already down to 30%. When I tried to plug in one of my main external batteries it registered as being completely flat, despite my having been careful to charge it the night before. Meanwhile back in the studio they were experiencing similar technical difficulties as Ustream refused to cooperate with the mixing setup. It was almost like everything was conspiring to prevent us from carrying out this broadcast: I had to laugh at just how ridiculous the whole situation was given the amount of exposure we’d had in the media leading up to the event. Thankfully things started to improve at around the 15km mark. My roving pit crews were fantastic, going out and buying new batteries for my iPhone which I picked up from them further down the course. Meanwhile Ustream was starting to behave itself again and viewer numbers were beginning to pick up. For the first time I could actually take notice of what was going on around me. 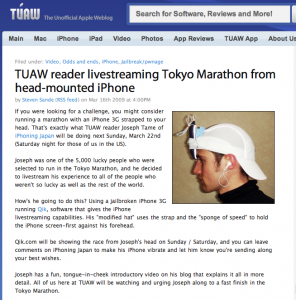 Best of Tokyo Marathon 2011 Live Ustream from Joseph Tame on Vimeo. The enthusiasm of the supporters lining the streets was infectious, cheering ‘FIGHT! FIGHT! …Ganbatte!! (ganbatte means ‘keep going!’ / ‘go for it’). This was the magic of the marathon, something I hadn’t experienced since the previous year’s event. Now that my attention was off the tech I was able to talk properly with my online viewers, in between shouting rally cries at the top of my lungs every time we turned into a new road (something that became increasingly important the further along the course we went and the tireder everyone else became). As we approached Ginza my studio-based teammates suggested that I drop in at the Apple store – the largest Apple Store in Japan. I thought that this was a little bit strange, but in my tired/confused state I assumed that they had prepared something for me, that I’d be expected. Arriving outside the store I climbed over the barriers and walked in – wearing my iRun of course. It didn’t take me long to realise that nothing had been prepared – heads turned, both staff and customers were stunned to see me. At this point I saw the security guard approaching me. He was obviously pretty confused by the situation and wasn’t really sure what to do. People were enjoying this spectacle, but it was highly irregular. Seeing him approach I knew that it was time for me to get on with the marathon, and so turned around, raised my fist in the air and shouted, “Ganbarimasu!” at the top of my voice. The store erupted in applause and laughter – everyone (other than the guard) was delighted by this little performance. I hopped back over the barrier onto the road – on with the race. As the pain increased with the iRun pressing against my back and around my waist, and the crowds quietened down a little, I switched my focus to my online audience. The number of viewers was growing, and the volumes of messages coming in via Twitter increasing. Back in the studio the crew picked out numerous messages to read to me – I was stunned by how far and wide our audience was spread. Japan, USA, UK, South America, mainland Europe… my brother and parents sent their support, as did Professor Hiroshi Ishii, Associate Director of MIT Media Lab. This support was invaluable. Despite the pain and exhaustion I knew I had to continue – I couldn’t let these people down! 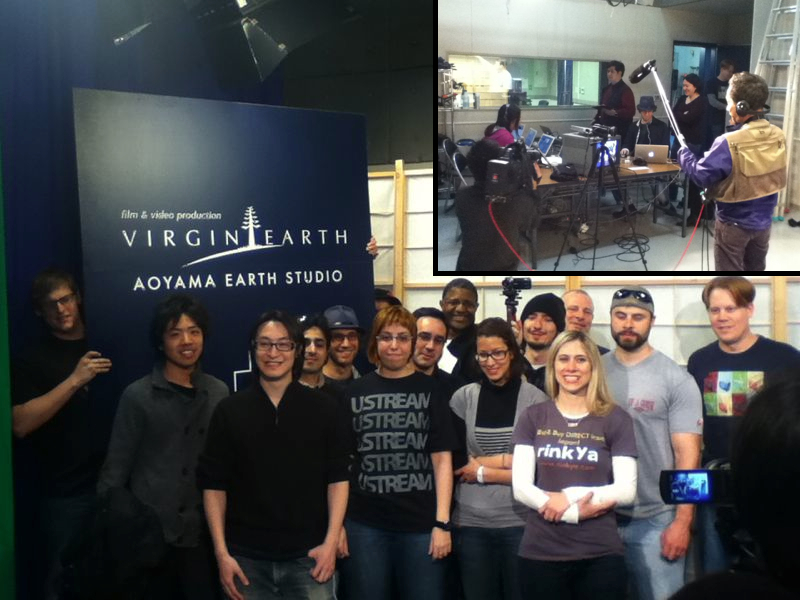 When I needed a break from talking and reacting I handed over to the studio staff (including my wife) – they then read tweets coming in/ provided other commentary for the stream. Spurred on by the support I continued past the 30 km mark. It was here that the next surprise came. Ahead of me on the left hand side of the road was a group of cheerleaders dressed in cute uniforms and waving pop-poms. That wouldn’t have been so odd had they not been chanting “Joseph! Joseph! Joseph!”. 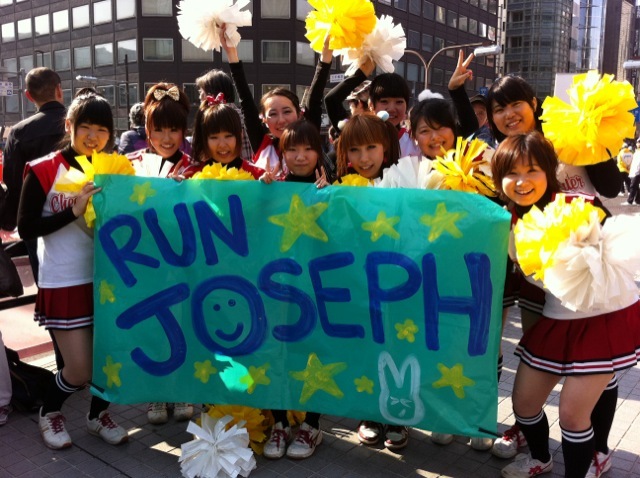 It was the Joshibi Cheer Dance Club SPIRiTS, who’d be recruited for our cause by mobile team leader Heather. What a fantastic surprise that was! (If you need a cheer-leading squad in Japan, they come highly recommended). Phil, my running companion was also being completely amazing. He had never run more than about 20km before and hadn’t done much training for the marathon itself. Despite this he was able to run the entire course without any problems, helping out with battery changes and putting up with all sorts of delays along the way. (I remember at one at one point him using my iPad to update his Facebook status as it had become a bit of a deadweight for me). 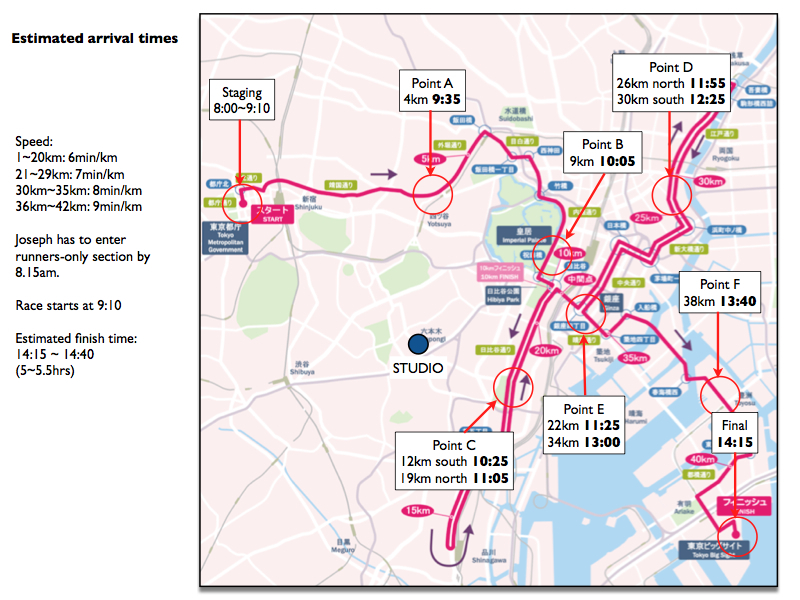 The final 10 km of the Tokyo Marathon is always really tough. I would of course be exhausted under normal circumstances, but the iRun now seemed to be getting heavier with every step. With the final leg being outside of the city centre the number of supporters along the street drops considerably. Also, due to technology-induced delays we were now surrounded by the slowest runners, many of whom by this stage were just walking. Despite all this and the growing pain in my legs, I was in great spirits. This was where the online viewers really helped me continue; my commentary for them becoming increasingly crazed and somewhat overenthusiastic. It was in that final section that I heard my name being called by a voice that I didn’t recognise. Looking to my left I quickly realised who it was: the family who in 2010 had wanted to support someone who was running the marathon but didn’t know anyone taking part. They have seen what I was doing online and decided to adopt me as the runner that they would cheer on. This father, mother and son team then came out onto the course with a sign reading “Ganbatte Joseph!”, and presented me with a bag containing a curry-filled bread roll to help me continue towards the finish. Whilst I’d had some communication with them following the marathon in 2010 I’d never actually met them again, and this was the first time that I’ve seen them in a year. 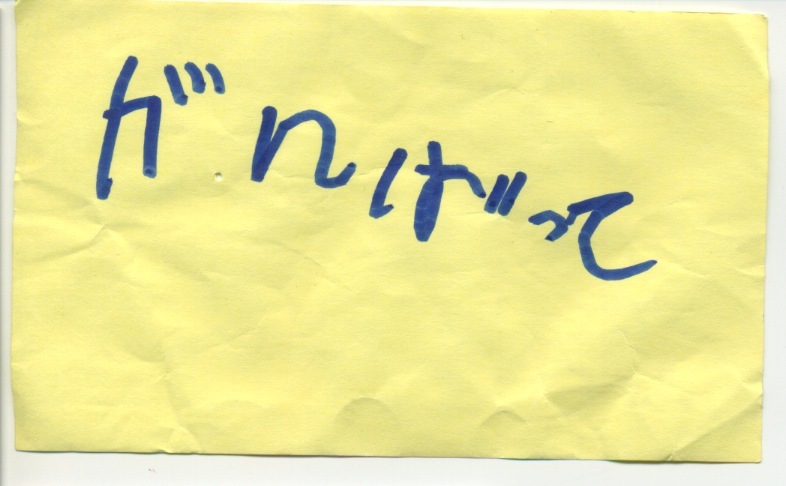 The son was of course a little bit more grown-up now and he’d actually handwritten a note for me that read” Ganbatte!”. They’d also prepared the same kind of bread, and handed it over whilst wishing me luck for the final stretch. The final official meet-up with one of my roving reporters was at Toyasu. Lem was there pointing his camera back at me, giving me that final bit of encouragement for the toughest couple of kilometres of the whole race. Then, just 1km before the goal I spotted Mario and to the left of the road shouting and that the Joseph. Mario and @hoteifetigreat were friends of mine who I’ve met via twitter following the marathon in 2010. We’d run together on a number of occasions and I was delighted to see them there cheering for me. As we entered the final approach I was still wondering if I’s actually make it to the end. Yes we’d come so far, but the exhaustion was overwhelming. It was difficult to keep my thoughts straight, I was in some kind of state of delirium. But then there it was, the goal. I shouted with delight as we crossed the finish line – we’d done it! 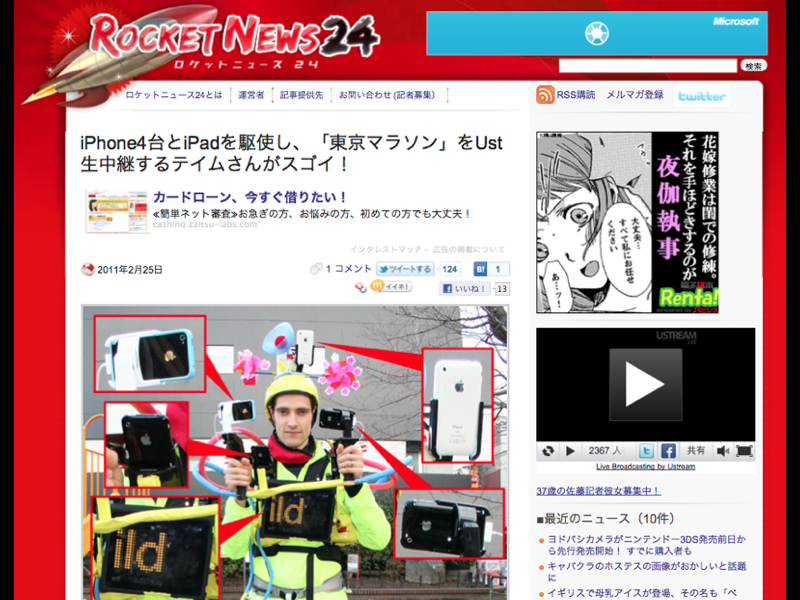 Of course it didn’t quite finish there: Fuji TV were waiting for my comments, as were CNN. Those interviews over we proceeded to receive our medals – that was a very happy moment. By the end, over 14,000 people had tuned in to watch the live stream, we’ve had over 1,000 tweets per hour from people showing their support from all over the world – and we’d completed a marathon in six hours and 28 mins. I was met by my wife and friends and together we returned to the studio to celebrate the victory that this project had been. Following that it was time to head down the pub for a well-deserved drink! The publicity leading up to, during and after the marathon resulted in my becoming quite well known amongst the running and tech communities here in Tokyo. My TV appearances on all the major channels also had quite an impact – far more than I expected – and I’ve now lost count of the number of times when people have recognised me due to that coverage. Being known for doing this crazy stunt has been quite helpful for my work in social media and live streaming, with many opportunities presenting themselves as a result. So what happens next? Well I’ve already entered the first Tokyo Marathon 2012 lottery and hope to hear the results of that by next month. If I fail the first lottery I’ll be entered into the second, and if I fail that… well, we’ll cross that bridge when I come to it. This project wouldn’t have been at all possible without the support of my friends and family here in Tokyo. I’m very grateful to those who took part both in the preparation and on the day itself, and to the wider community who have supported me in my ridiculous projects through social media and word-of-mouth. This project once again confirmed for me the magic of the fantastic community we have here in Tokyo, a city of endless possibilities. And as for the Run – well, I don’t think this is the last we’ll see of the it. Watch this space. I would like to extend special thanks to @stevenagata for the many hours he put in behind the scenes to ensure that the technology did what we wanted it to do (most of the time! ).Thanks also to the studio presenters @depepi @micamica59 and @kurisuteen (who flew over from South Korea to join us). Also to @heatherarussell who headed the mobile team, @lifeyouTV for video coverage, @drzuco @jimgris @imorpheus and @shoganai for photography, my mother-in-law for lending me her iPhone 4, and additional support from @ccjapan @jonnyli @oren_the_red and @sireneast. Again, huge thanks to Rinse, Miki and the team at Virgin Earth Inc. 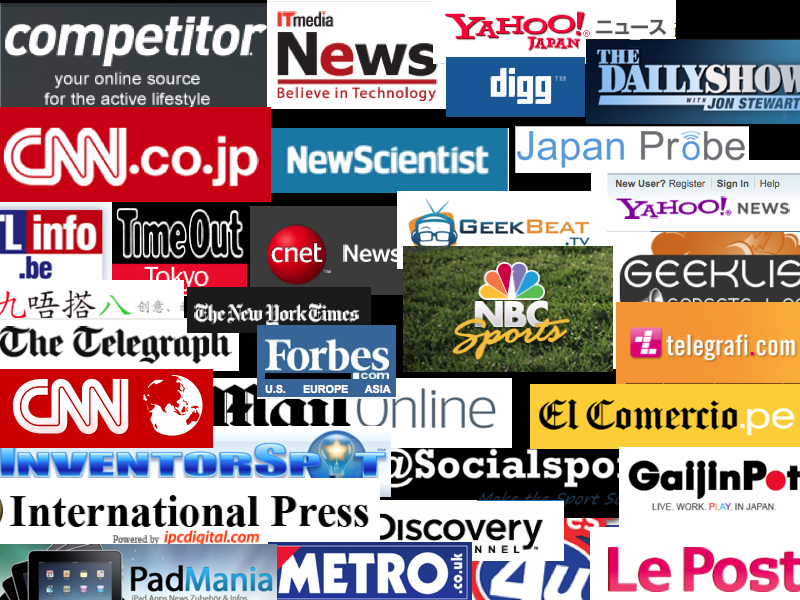 Thanks also to Runkeeper and the many media organisations that helped spread the word about this event – notably CNN. Special thanks to my wife @twinkletamefor putting up with all the madness and supporting me throughout!